Line from the film: "For more than 150 million years, dinosaurs roamed every corner of the planet"
The pre-title sequence of the 2007 IMAX documentary Dinosaurs Alive details an incredible find. In the sands of Mongolia’s Gobi Desert, researchers unearthed the skeletal remains of two dinosaurs, a Protoceratops and a Sharp-Clawed Velociraptor, each of whom died while fighting the other (the velociraptor’s claw is still embedded in the jaw of the Protoceratops). As narrator Michael Douglas tells us, this battle to the death, which occurred some 80 million years ago, is now frozen in time… forever. Just prior to revealing these fossils, Dinosaurs Alive presents a computer simulation of the fight, where we watch a CGI velociraptor sneak up on what it assumes will be an easy kill, only to realize that it’s picked the wrong dinosaur to mess with. Surprisingly, this dramatization isn’t as interesting as the remains themselves, and, like the rest of its computer-animated scenes, weakens the movie as a whole. 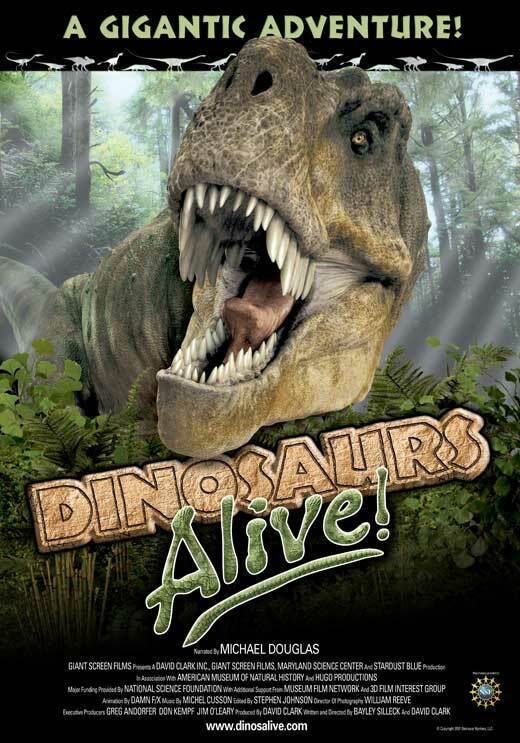 For 150 million years, dinosaurs roamed the earth, and as Dinosaurs Alive shows us, we don’t know nearly as much about them as we thought we did (per the film, we’ve only uncovered 2% of the dinosaur species that once called this planet home). 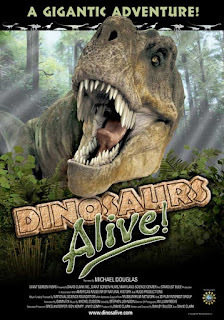 By tagging along with paleontologists as they unearth new remains and following them into the lab where everything is meticulously separated and cataloged, Dinosaurs Alive is there when an entirely new species is discovered, while at the same time relating a few facts about dinosaurs sure to amaze a good many viewers. In addition, the filmmakers produced a handful of computer-generated simulations, set millions of years in the past, to show us how these creatures may have interacted with one another. Co-directed by David Clark and Bayley Silleck, Dinosaurs Alive is at its best when focusing on the men and women that do all the legwork, from the initial explorers who first traveled to the Gobi Desert in the 1920s (seen in archive footage) to the scientists of today, working in a field so relatively young that any expedition might reveal the existence of a brand new species, such as the Effigia, a 9-ft. long creature that looked more like a crocodile on two legs than it did a dinosaur (oddly enough, it was a graduate student who made this most recent discovery). At the same time, I was surprised to learn that some velociraptors were covered not with scaly or leathery skin, but feathers, further proof that birds, and not lizards, are the descendants of dinosaurs. In comparison to moments such as these, the CGI scenes (which are thankfully few and far between) feel like cartoon breaks, and instead of “bringing history alive”, as intended, sabotage the film’s overall pace, slowing things to a crawl. I’ve no doubt kids will enjoy seeing dinosaurs chase each other around, but for those of us wanting to know more about these amazing creatures, there’s no substitution for the real thing.